Let us introduce you to our company. 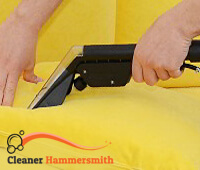 We are experts at upholstery cleaning in W6. We are dedicated, hard-working, meticulous and ready to do anything to give your upholstered furniture a good clean. We have extended working hours, meaning we are available from Monday to Sunday. The best thing is, you can arrange for your service to be provided any day. We are always ready to give you a helping hand. If you are interested, our company will get things done for you. Give us a call straight away. 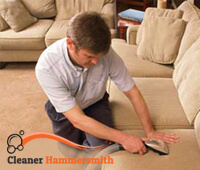 You will be fascinated by our amazing upholstery cleaning service in Hammersmith. We have professional equipment, we are well-trained, plus we have vast experience in this business. Let us tell you a little more about how we clean upholstered furniture. We have been in business long enough to know that every piece of furniture is different and every situation is different. We are aware that every stain needs different kind of treatment and that not all products work in every situation. We have amassed knowledge about upholstery cleaning and we have also experimented with various products and solutions. We have a bunch of cleaning supplies and we train each and every cleaner how to use them and when. We think it is important that all cleaners are expert at cleaning so that we can offer the same quality every time, no matter which cleaning team we send to your property. Our cleaning methods are tried-and-true but we also utilise modern techniques to clean upholstered furniture that are not toxic. They provide further protection for your furniture so that you can enjoy it longer. Usually, a cleaning session lasts a few hours. We are dedicated and we have an eye for the detail. We take our time and we stay as long as necessary. When we are done cleaning, your furniture will smell fresh and there will be no stains or dirt. We will work according to your demands and requirements. Our company is available in W6, Learn more about our service by contacting our call centre. It is open 24 hours a day, 7 days a week. No matter what time of the day it is, just call us.